Your train journey through Greece will be unforgettable. Greece is a mystical blend of ancient history and modern day hedonism. Athens has a suburban railway that offers travellers a very fast, affordable and reliable travel option. 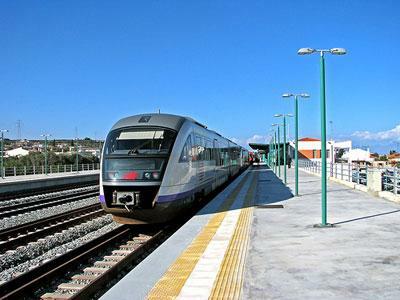 The suburban railway connects the Piraeus Port and the airport to the city centre. There are also railway stops that connect the surrounding areas too. The suburban railway stops are close to tourist attractions and archaeological sites, which makes the suburban railway a great option for tourists and commuters alike. One of the biggest railway junctions is called the Acharnes Railway Centre, which is also known as “SKA.” It is a two-level railway station that is just north of Acharnes. In SKA, you will be able to use the Piraeus to Platy railway line, and the Piraeus to Athens Central line. You may also reach Thessaloniki and Oinoi. You will be able to use the Athens Airport to Kiato railway lines. The lines also allow you to reach East Attica, the Athens Metropolitan Area and Corinth too. The service connects the airport and Kiato to the centre of Athens and Piraeus. Part of the service operated for the first time during the Olympics games of 2004 and the first line to operate was to and from the 'Eleftherios Venizelos’ Athens international airport and access to the Olympic facilities. There is a railway line that is 135 km long and goes from the airport in Athens to Kiato in the Peloponnese region. Take the train from Kiato, and it will take you around 2.5 hours to get to the airport. It passes the city centre by just a few miles, so you may get off and take a bus into the city or to the port. Consider using the rail system rather than hiring a car. You may see promotions that claim Athens has free parking, but the free parking rule has limitations, and there are many places that do charge. Plus, the city makes back the money is loses from free parking by charging tolls and fees. In addition, traffic and navigation is rather difficult if you are a tourist and are not used to the roads. The public transport system is cheaper than hiring a car, it is far less complicated, and it is dramatically faster than driving. In addition, most places of interest are within pedestrian areas, which may mean you have to walk further if you have a car because the bus and train stops are closer than the car parks. The Thessaloniki to Larissa suburban railway uses electric trains to serve ten stations in total. The stations are dotted around the coastline of Pieria, which is why it is popular with tourists. To travel the entire line, takes around 1.5 hours, and the train holds around 500 people. This runs daily every hour, from around 6:30 am till almost midnight and it connects Agios Andreas to Rio and Agios Vasilios, offering a comfortable journey. This service also goes to the hospital of rio and the university of Patras. Animals can also travel on the trains in Athens as long as they on a lead and muzzled. Cards and tickets are bought at the various stations, by telephone or online. For anybody using the trains with a disability passengers need to contact the TRAINOSE at least 48hrs prior to their journey. Stations provide ramps for wheelchair use, ticket booths at lower heights for wheelchair users, audio announcements and low height cancellation booths. Athens has a crime problem, with reported pickpocketing as early as 5:30am in the morning. A common trick is to hold a map in front of your face and to fake being lost while others unzip your pockets and bags. Ironically, the thieves tend to congregate in places where the signs say, “Beware of pickpocket thieves” because whenever people see the signs they touch the pocket with their wallet in, which shows the thieves where to strike.